Our "Rustix" range of traditional hand forged ironmongery was originally developed in response to demand from customers faced with the problem of sourcing original hardware when restoring period properties. Carefully sourced for the quality of workmanship, the range has grown over the years and includes many authentic replicas of 17th and 18th century patterns. The hand forged nature of the range means that no two pieces are identical yet quality is of the highest standard. Most items are available in our "Rustix Waxed" finish for internal use and "Rustix Armour Bright" for both internal and external applications. 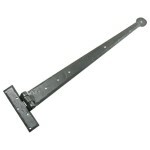 A range of beautifully crafted hand forged steel Tee Hinges from our Rustix collection in sizes to suit cabinet & cupboard doors and full height doors up to 44" (1115mm) wide. Available in Waxed or Armour Bright finishes. Additional hinge types from our hand forged "Rustix" collection for full height doors and cabinet doors. 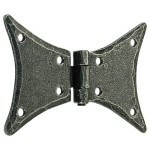 H Hinges, HL Hinges and Butterfly Hinges etc in Beeswax & Armour Bright finishes.